"I can think of no other structure created by man as altruistic as the lighthouse." Lighthouses are the castles of America, Sheila Ramus says. Ramus, a member of the United States Lighthouse Society, compares them to the great stone fortresses of Europe. Europeans "weren't raised in them, they don't live in them today, but they still love their castles," she says. Lighthouses of North America, them, is an hour-long ode to these monuments of the American coastline. In a catch-all style reminiscent of something you'd see on PBS, the programs explores the history and character of lighthouses from Maine to California, featuring interviews with the people who take care of them�lighthouses have been automated for decades, but around the country, historical crusaders work to preserve the original flavor and architecture of these tremendously diverse buildings. The material will likely interest history buffs, but the quality of information varies from the accessible (stories of ghosts and legends that surround each lighthouse), to the extremely technical (descriptions of the different types of glass uses to refract light for miles and miles). Wayne Wheeler, head of the USLS, provides a lot of the narration and background in dry interview segments, and while stories of the role lighthouses played during the Civil War are great, his long lecture about the six sizes of a certain type of lens is a little boring. Of course, the president of the United States Lighthouse Society probably isn't the one attracting an adoring throng of admirers at a party. Unless it's, I don't know, a meeting of the Ken Jennings fan club or something. Most compelling are, of course, the visual tours of the structures themselves, a dozen of them from around the country. The varied scenes (barren coasts, craggy cliffs) provide great scenery, and though the DVD's picture quality isn't the best, the footage is wonderful, particularly an illustration of how the lighthouses operate in foggy weather. At a little under an hour, Lighthouses of North America isn't the most in-depth documentary, but it does shed some light on a rather obscure part of American history. Image Transfer Review: Shot on video, Lighthouses DVD transfer exhibits problems above and beyond the limits of the source material. Though colors appear natural detail is obviously lacking a bit, and the video images appear fuzzy, but moreover, the transfer seems to have picked up a lot of digital artifacts in the transfer to DVD. The problem is very obvious on shots of the craggy rock face at the base of many of the lighthouses, and the aliasing/artifacting effect is very noticeable even on a 27-inch TV. Audio Transfer Review: Audio is presented in what sounds like a basic stereo mix, one that presents narration cleanly and handles the feature's spare sound effects and music well enough. Talk is anchored in the center, with some bleed into the mains, and music sounds fairly full. Extras Review: No extras are included, aside from a web link to the Koch website. Though text histories of select lighthouses or a photo gallery might have been nice for history buffs, I don't see the lack of features as much of a detriment for this type of release (though subtitles would have been nice). 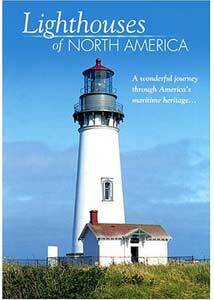 Though the presentation is a little dry, Lighthouses of North America is worth a look for history buffs interested in the function and history of some of America's most iconic structures.